Pune can never get enough of its street food and especially the variety of pav-based dishes it has. Sample the very best at these places. Pocket-friendly and always brimming with customers even on weekdays, you will certainly have to wait to be served. You are, however, notified about your turn through an SMS so you can run a few errands in that time. Super convenient! Their misal comes in three varying degrees of spiciness, and we advise you to not be brave here. Soothe your stomach with a cool glass of Tak/Matha or buttermilk at the end and you will walk away happy, having spent only about INR 200 for two people. Legendary, cannot begin to describe the steaming hot and spicy vada pavs from JJ Garden Vada Pav Centre in Camp. Situated in the lane behind Dorabjee’s on Moledina Road, we are told that he makes close to 1,000 vada pavs daily that come at just INR 15 a pop. He will also quickly dole out large orders of 200-300 vada pavs in a matter of minutes without batting an eyelid! You need only have two of these with their masala tak for a complete meal under INR 50. For an extra crunch factor, you can even ask for some of the fried pieces of batter. You can almost miss this shop if you’re not looking for it but you’ll be certainly rewarded when you try out their pav bhaji at INR 70. 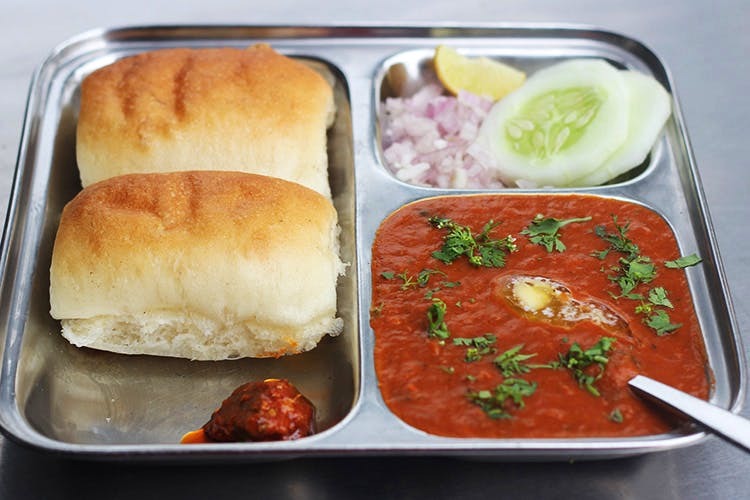 With the right amount of spice and buttery pavs accompanying it, we’d say Mumbai’s pav bhaji has a substitute in Pune. You can even take-away large quantities of the bhaji where one kg will cost you INR 140. Dinshaw’s brand of ice-cream has been around since 1932 but this quaint little café in Koregaon Park offers many Parsi delicacies, apart from shakes, frappes, smoothies and of course, ice-cream. Their kheema pav is absolutely bang-on in terms of authenticity and flavor. Though slightly steep in the price range, it is definitely worth the INR 260 you pay. Known for its cold coffee which its patrons swear by, its masala pav also delivers in terms of flavor and quantity. Though it is always crowded and you might not get a place to sit, don’t forego an opportunity of spending an evening here. It gets cooler, one plate of masala pav will cost you just INR 50.